Last month I hitched up the Pup and drove back up to North Georgia to attend The Fly Fishing Show Atlanta. I left St. Augustine after work on Wednesday night and boondocked at the Cracker Barrel in Perry, GA. After enjoying Mama's Pancake Breakfast in front of the fire the next morning, I continued on to Don Carter State Park in Gainesville. Don Carter is the newest park in the Georgia State Parks system, but it's been open for several years now. All of the RV sites are paved, and pretty level, with electric and water hookups and a gray water dump. I made my reservation pretty early on, so I was able to get a prime site on a point stretching into Lake Lanier. Since the leaves weren't out on the trees yet, there was an almost unobstructed 270° view of the lake! After setting up the camper at the campsite, I drove up to Blairsville to visit family. I took the long way up through Helen just to enjoy the scenery. Since I was so close to the Upper Hooch and the Chattahoochee National Forest I stopped to make a couple casts in one of my old favorite spots. I didn't catch anything, but then, I really didn't expect to with high water, saltwater gear and only 5 minutes of trying!! 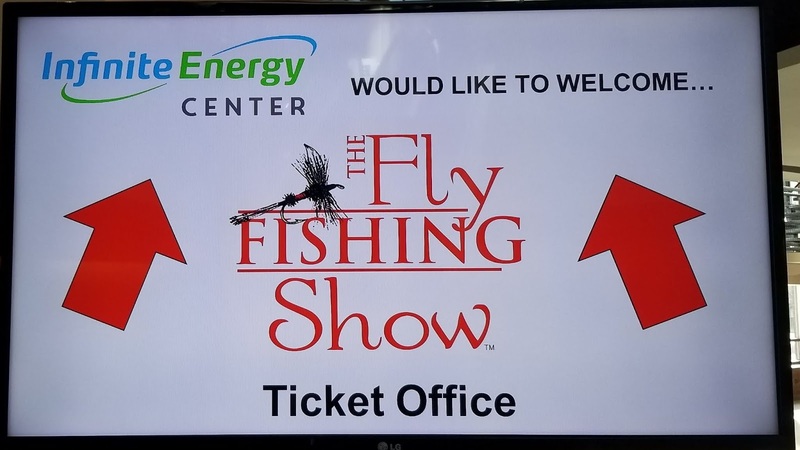 The Atlanta Fly Fishing Show actually takes place in Duluth at the Infinite Energy Center and is a two-day engagement over Friday and Saturday. In between, on Friday evening, the International Fly Fishing Film Festival is held at a nearby hotel. The IF4, as usual, had a cash bar in the lobby and, this year, they handed out fresh bags of popcorn to enjoy during the films. We were also treated to some fine pickin' from a local bluegrass ensemble while waiting for the movies to start! I always enjoy attending the film festivals, but I can't help but thinking that a lot of the films are starting to look the same. I hate to complain because I do enjoy them, but I'm ready for something really different. Is the world ready for a bluegill fishing film? Maybe something with music that doesn't make my ears ring would be nice, too. But that's just me, I still encourage everyone to attend, especially if you can take a guest that hasn't made their mind up yet about flyfishing. These short movies will definitely help get them hooked!! 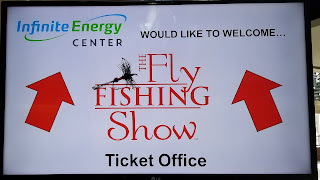 If you ever have the opportunity to attend one of The Flyfishing Shows near you, I highly recommend that you do. These shows are always made up of all the local shops making great deals, manufacturers demonstrating new products, clubs and organizations signing up new members, lodges and guides showcasing their services, casting ponds to try before you buy and casting demonstrations, author booths, tying demo's and full, multi-hall lecture schedules. You'd be hard pressed to see and do everything in the two days of the show! The Atlanta Flyfishing Show is always a blast and absolutely worth the trip! I'm already looking forward to the 2020 show and I will plan to attend. I hope you can make it! Make sure you stop me and say hi if you see me! Please enjoy the photos, make sure you follow @TheSuburbanAngler on Instagram and Facebook to see live coverage of all the shows I attend. And, as always, if you have any questions, comments or suggestions, please get in touch!! A good night's rest followed by a hearty breakfast in front of the fire! On the road again!! All I had with me was saltwater gear, but I couldn't resist making a few casts into the Upper Chattahoochee River above Helen. That water was high, but crystal clear!! It was such a gorgeous day, if I didn't have previous plans, I would've head deeper into the National Forest and checked some of my old favorite spots! Checking out some cool new products in the Yeti Coolers booth! The waterproof blanket and folding chairs would be perfect for the camper and the tote bag and wheeled cooler look ideal for surf casting sessions!! Alpharetta Outfitters had some great deals on clothes, gear, guided trips and destinations! ARC Fishing was here for their first Atlanta The Fly Fishing Show!! Folks were stopping by to get the rundown on their innovations in fly line, leaders and tippets. They had some fantastic show deals going on, too! Lots to drool over in the Stealth Craft Boats booth! I really like the look and feel of these Towee Boats skiffs!! And, there's really no better endorsement for a product than to get to speak with the owner/designer at these shows! The Angling Bookstore is now on Instagram!! Give them a follow for one of the best selections of fly fishing publications going!! Author Steve Hudson having fun talking north Georgia fly fishing and signing his books! Got to hang out a bit and catch up with Mark in the Original Ty-Rite booth!! This is one of those awesome little products that you don't think you need until you use one! It's the cure for small flies and cold fingers!! Mark also had products from other small companies on display, like Brook Fishing Equipment, Ascent Fly Fishing and Fly Trap Holder. Talked a little shop with Mark Keller, celebrity fly tyer and creator of the Eflyz. There's still a couple slots open on the Eflyz species board that I think I'm going to try to fill in this year!! Check out these amazing hardbody flies for yourself!! I was a little late, but thoroughly enjoyed Steve Hudson's presentation on fishing for brook trout! Look for his new book on the subject scheduled to be released this spring!! Enjoying some mountain music while we wait for the IF4 to begin!! Morning of Day 2 at the Atlanta Fly Fishing Show! The Fly Fishers International booth is already buzzing with new tyers learning the fly tying basics! The Sisters On The Fly are showing one of their incredible, vintage travel trailers! Legend Dave Whitlock demonstrating the tying techniques that go into his Vortex Divers. Made a stop at the Mauser Fly Fishing booth to check out the new Arete line of trout rods! Their first rod line, The Waterman, was an incredible casting rod, so I have no doubt the Arete will be equally adept!! The guys at Mauser have some great plans for the near future, so it's definitely a brand to watch!! The Unicoi Outfitters booth is always very popular!! They even had a raffle for a Nacoochee Bend self-guided trip!! Have you seen the fish from Nacoochee bend?!?!? Catching James mid-donut and David tying up some bugs in the River Through Atlanta booth! These guys are the pros for fishing the Chattahoochee River and all of North Georgia! Checking out the Santee Boats booth. Great looking skiffs with some awesome option packages and rigged to order! The full led light package is a great touch! Bob Clouser demonstrating casting techniques on the casting pond! Tyer's Row is always hotbed of activity!! The Seigler Reels booth has stayed very busy throughout the show. Have you seen their award winning line of big game fly reels? The folks that protect this amazing urban fishery were hard at it signing up new members! Author Jim Mize read an excerpt from his book, A Creek Trickles Through It, after giving pro tips on making your catch seem larger in stories and photos! I may have to test a few of his techniques... I'm sure a lot of folks on Instagram already have!! Enjoyed a fascinating presentation on bonefishing the Bahamas with Oliver White. Go ahead and add this trip to the bucket list! My buddy Todd Arnold ( @615groundpounder ) spent the weekend on Tyer's Row tying up some mean looking Game Changers!